Sanderson Lincoln is pleased to announce that the highly-anticipated 2014 Ford Fiesta ST is now available at our Glendale, AZ dealership! This slick, fuel-efficient Fiesta brings to life everything you’re looking for in a sporty little sedan. Its engine not only returns efficiency but also power and handling. The interior is comfortable and spacious with new innovative technologies that make it an ideal 2014 model. Let’s take a closer look. 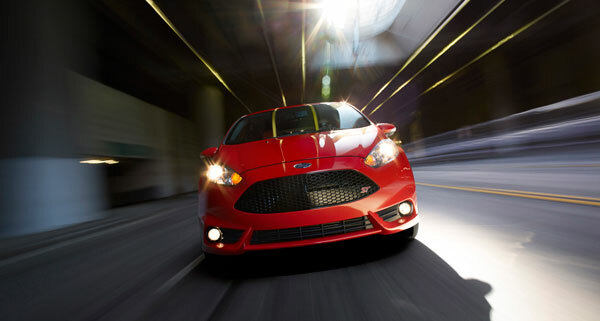 Under the hood of the 2014 Fiesta ST is Ford’s high-performance 1.6-liter EcoBoost engine, rated to return 197 horsepower and 202 lb-ft. of torque. Noting, those are average power ratings of a much larger engine. Ford has managed to perfect the design of their small 1.6-liter engine, incorporating EcoBoost technology for even more power and efficiency. Oh yeah, we forgot to add that the Fiesta ST returns 26 miles per gallon in the city and 35 miles per gallon on the highway. Talk about limiting gas station visits. 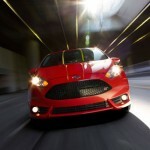 Aside from the engine difference, the 2014 ST also features a unique body that sets itself apart from the classic Fiesta. It sits on 17-inch wheels with performance tires with ST-designed cloth sport seats lining the interior. Ford’s al-new 6.5-inch color-coded touch-screen display rests in the middle of the Fiesta S T featuring SNYC® with MyFord Touch®, 3D Navigation and customizable controls. If we haven’t sold you yet on the fantastic new features of the 2014 Fiesta ST, be sure to swing by Sanderson Ford today and have a look yourself. We promise you won’t be disappointed.